I have just released the first beta version of the Swinglets project on java.net. This project is a collection of Java Swing components developed by me. In this release, only two components JClock and JRuler is provided. I have few other components in development which will be released soon. This is not a stable release, so expect lots of bug and an unstable API. By sharing this project with the community, I intend to build and grow this library. Users are requested to use this library and send your feedback. Even better, join this project and submit your improvements. Please note that this library depends on the jscience library from jscience.org. This library is not included with this project. You need to separately place it in the classpath. In this last part of the series, I will show how to save and retrieve data from our embedded database. Now you can use this class to query the database or save data to the database using the two functions provided. This is a simple class. You can extend/modify it to do more complicated tasks. In my last post, we created MyDbModule project. In this part, I will tell you how to start the embedded database when our module gets loaded. 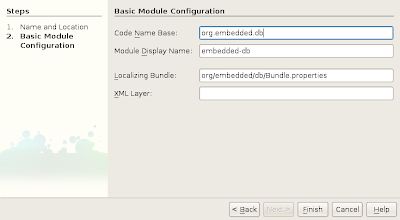 Expand the Source Packages folder of the embedded-db project. Right-click on org.embedded.db package and select New > Java Class. Name the class as Startup. Then click on Finish. This will register our class as the startup class when the module is loaded. In line 25, we can create our database tables as required. To shutdown the database when our application is closed, we override the closed() method. Shutting down the JavaDB engine is the same as getting connection except we pass the 'shutdown=true' parameter with the connection string as shown in line 43. Note the ':;' characters after 'jdbc:derby'. While shutting down, JavaDB throws an SQLException with SQL state code 'XJ015'. We need to ignore this exception which is done in line 45. That's it. We have created a module which loads and/or creates our database on startup and shuts it down when the application is closed. In the next and final blog, I will show how to connect to the database and save/retrieve data. 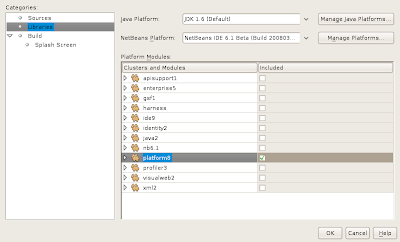 Here, I outline the series of steps to integrate JavaDB a.k.a Apache Derby with your Netbeans module. 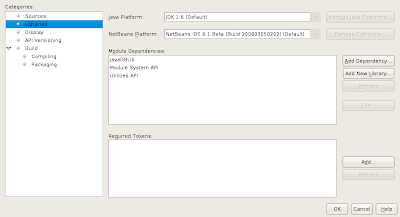 JavaDB acts as the embedded database for our Netbeans module. The network server features of JavaDB will not be utilized. I will also show how to configure the database so that it is stored in a custom location rather than the default. Note: In trying out this guide, it is assumed that you are familiar with the Netbeans Platform and related concepts such as module, suite, etc. 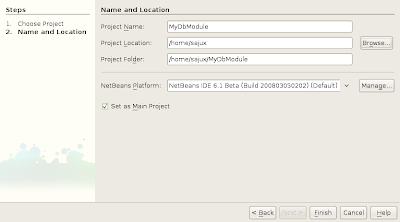 This guide is based on the latest Netbeans 6.1 Beta platform. Create a module suite with the name 'MyDbModule'. You can give any name you want. 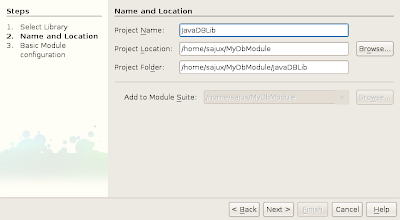 If you want to add JavaDB to an existing module suite project, skip this step. Right click on the project and select Properties. Select Libraries. In the Platform Modules section, uncheck all modules except platform8. We don't want other modules for now and if necessary, they can be added later. Click Ok when done. Expand the suite tree node. Type Code Name Base as 'org.embedded.db'. Keep the rest as default. You may change the module display name. Your new module is added to the suite 'MyDbModule'. Now add a dependency for JavaDB to this new/existing module. 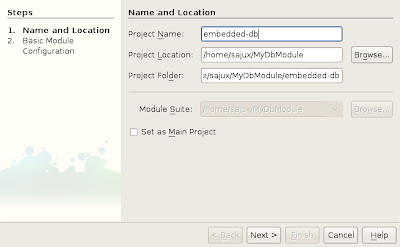 JavaDB is installed with Java SE 6. If you do not already have JavaDB, please install it first. Browse for the JavaDB jar files. For a default installation in Linux, you will find it in /opt/sun/javadb/lib. For a default Windows installation, it will be in C:/Program Files/Sun/JavaDB/lib. Select derby.jar and then click Next. Give the project name as 'JavaDBLib'. Then click next. 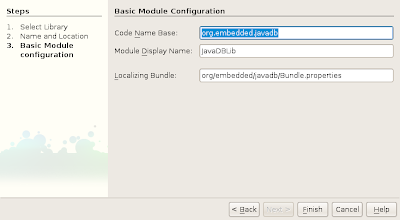 Set code name base as 'org.embedded.javadb'. Leave the rest as it is. Then click Finish. 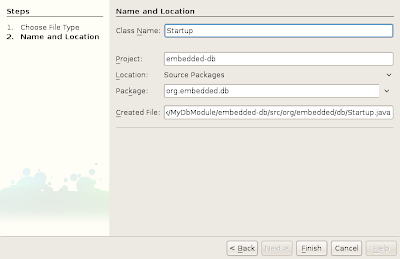 The library is added to the suite as well as a dependent library to 'embedded-db' project. So far, we have created a new module suite, added a module and a JavaDB library wrapper to it. In the next part, we will dive into coding and see how to start up our database in our own location . Also, we will connect to the database using Java Persistence API and do some simple queries.